The Rotherham depot of collapsed national delivery firm, City Link, looks set to close after the administrators confirmed that 2,400 staff have been made redundant. The depot at Bradmarsh Business Park at Templeborough, which employed around 34 staff, was one of 53 City Link depots nationwide affected when news broke on Christmas Eve that the company, owned by venture capitalists, Better Capital, would enter administration. On December 24 2014 City Link Limited was placed into Administration and Hunter Kelly, Charles King and Tom Lukic of EY were appointed joint administrators. Pest control company Rentokil Initial sold City Link for £1 in 2013. Hunter Kelly, joint administrator to City Link Limited, said: "City Link Limited has incurred substantial losses over several years. These losses reflect a combination of intense competition in the sector, changing customer and parcel recipient preferences, and difficulties for the company in reducing its cost base. "The strain of these losses became too great and all but used up Better Capital's £40m investment, which was made in 2013 and intended to help to turn around the Company. Despite the best efforts to save City Link Limited, including marketing the Company for sale, it could not continue to operate as a going concern and administrators were appointed. "We will also provide support to employees relating to potential redundancies. We are now beginning the process of realising the Company's assets." The timing of the announcements, and the practices of Better Capital have come in for strong criticism from unions such as the RMT. Many staff operated as self-employed and as sub-contractors, finding themselves down the order of creditors and unlikely to see money they are owed. The union claims that City Link and it's financial backers will have no liability for redundancy payments and the staff will have to apply to the government scheme. 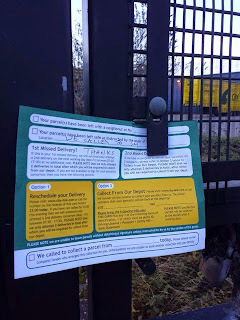 Mick Cash, general secretary of the RMT, said: "There has been a truly horrific catalogue of mismanagement at City Link and that staff and their union have been starved of basic information while a plot was hatched to publicly collapse the business on Boxing Day when in fact it was already declared insolvent. What a despicable and callous ‎manipulation of thousands of workers and their livelihoods over Christmas as the venture capitalists cut and run leaving a trail of chaos and misery in their wake." A demonstration was held last week at the Rotherham depot (pictured).